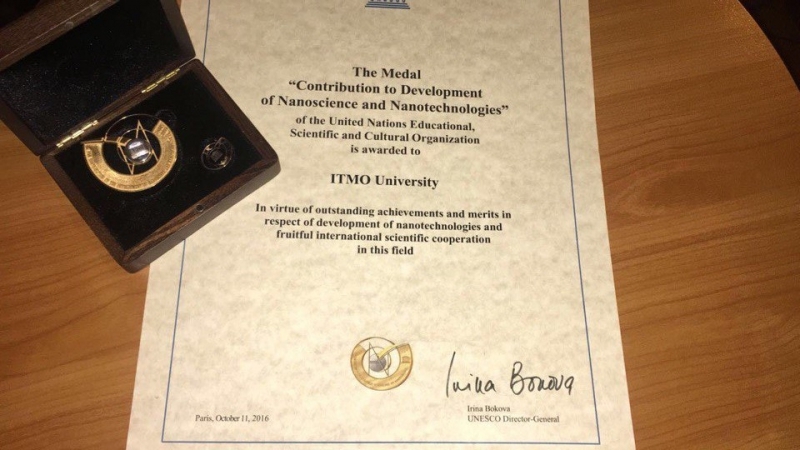 ITMO University received the UNESCO Medal «For the Development of Nanosciences and Nanotechnologies». 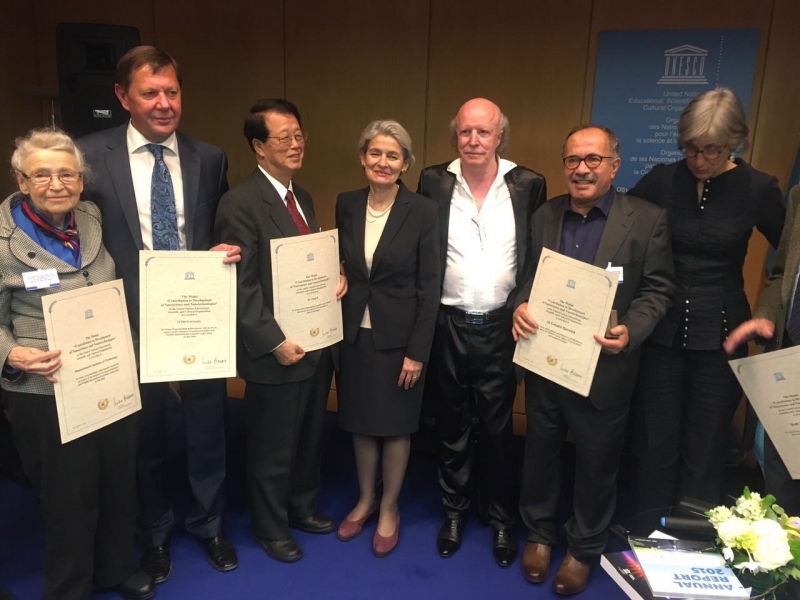 Rector Vladimir Vasilyev accepted the award from UNESCO Director-General Irina Bokova during an official ceremony in Paris — as the official statement said, for «the university's unique environment: science — education — innovations». «This award will further increase our university's visibility and contribute to its great academic reputation. During the last years, ITMO's achievements in nanotechnologies and new materials have made it world-famous; what's more, UNESCO's recognition can affect our position in the THE (Times Higher Education) rankings. Expert opinions are essential for them, and now ITMO will be known as the UNESCO award winner», comments Daria Kozlova, Vice Rector for International Relations. The award took place as part of the anniversary celebrations of the World Science Day for Peace and Development — an official holiday that is celebrated on October, 10th since 2001. On this day, UNESCO's staff conduct lectures, seminars and roundtables on global concerns that can be addressed by closer cooperation between scientists and general public, and organize exhibitions and other cultural events. Research in nanotechnology can now be applied in almost any field. In medicine, that would be targeted drug delivery; in chemistry, that would be the so-called «lab-on-a-chip» that will allow conducting chemical analysis of substances on molecular level. Using nanotechnologies in information systems and information security is yet another possible application; and one should not forget the construction of quantum computers that may well be the most anticipated research in the nanophotonics field. «From my point of view, receiving the UNESCO award was only natural. Our university has many achievements in different fields in what has to do with nanotechnology and new materials. My team at the Center for Advanced Methods of Materials Research studies the properties of nano objects, and techniques to study them. Scientists from the „Optical Information Technology“ Center work with quantum dots. And these are only a few of the directions of our scientists' research», shared Alexey Romanov, Head of the Center for Advanced Methods of Materials Research. ITMO's «Nanotechnologies» Research and Learning Center has been around for almost nine years. Its research and educational activities mostly have to do with such directions as nanophotonics, nano biotechnologies, nanodiagnostics, functional and composite nanomaterials and nanosystems and other. The International Research Center for Nanophotonics and Metamaterials has been around for more than six years, and the International laboratory «Solution Сhemistry of Advanced Materials and Technologies» — for two years. There's also the Center for Optics of Quantum Nanocrystals and other laboratories, as well — the articles and publications of these research units are included into the top research journals a regular basis. «Our university has organized a whole system for project development — from fundamental research to commercializing inventions», shares Rector Vladimir Vasilyev. «As for accomplishments in science, Nature named us a rising star: during the last three years, our university has greatly increased the number of publications with high citation rate. If a scientist wants to start a business, we also have all the appropriate facilities for it. We have business incubators, startup accelerators, an engineering center and other similar units. What is more, we work on such global tasks and problems as those of personalized medicine, ecology and nutrition». The UNESCO Medal for «Contribution to development of nanoscience and nanotechnologies» was established on 1 March 2010 at the request of the International Commission for the development of the Nanoscience and Nanotechnologies section in a series of UNESCO’s Encyclopedia of Life Support Systems (EOLSS). The first ones to receive it were Nobel Prize Winner of 2000 Jaures Alferov and Bai Chunli, President of the Chinese Academy of Sciences. During the six years of existence, most of its recipients were representatives of Russian scientific community — and now ITMO is among them, as well.